A jalapeño is a hot pepper. Pronounced: holl-uh-pehn-yo. Common pronunciation error: many people say the last two syllables like vino. Remember that the 'n' with the tilde (ñ) adds that "y" sound. It is called an enye (en-yah). Albondigas is a meatball soup. Pronounced: al-bon-dee-gus. Common pronunciation error: putting the accent on the wrong syllable. This is a chunky salsa. Pronounced: peek-oh duh-guy-oh. Common pronunciation error: pronouncing two Ls as in the word ball. Pollo is the Spanish word for chicken. Pronounced: poy-oh. Common pronunciation error: pronouncing two Ls as in the word ball. A tortilla is a very thin, flat Mexican pancake-type bread. Pronounced: tor-tee-ya. Common pronunciation error: pronouncing two Ls as in the word ball. Common in Mexican restaurants, picante is a red spicy sauce. Pronounced: pee-con-tay. Common pronunciation error: emphasizing the wrong syllable and forgetting the last E.
If you want a beer, ask for a cerveza. Pronounced: serv-ay-suh. Common pronunciation error: those last two syllables often have unusual pronunciations! Don't go too heavy on the Z.
Guacamole is a condiment made from avocados. It is usually served with salsa. Pronounced: gwahk-a-mole-ay. Common pronunciation error: saying the last syllable as if it rhymes with bee. Tip: If you just order "guac" (gwahk) your server will know what you want. Fajitas is a hot dish made with sautéed onions, peppers, and meats and usually presented with cheese, beans, salsa, guacamole, and tortillas. Pronounced: fuh-heet-uhs. Common pronunciation error: pronouncing the J as if it was like Judy. Beans are called frijoles in Spanish. Pronounced: free-ho-lays. Common pronunciation error: pronouncing the J as if it was like Judy. Quesadillas have very thin crusts with cheese melted on top and sometimes other items—think of it as a Mexican pizza. Pronounced: cay-suh-dee-yuh. Common pronunciation error: pronouncing two Ls as in the word ball. 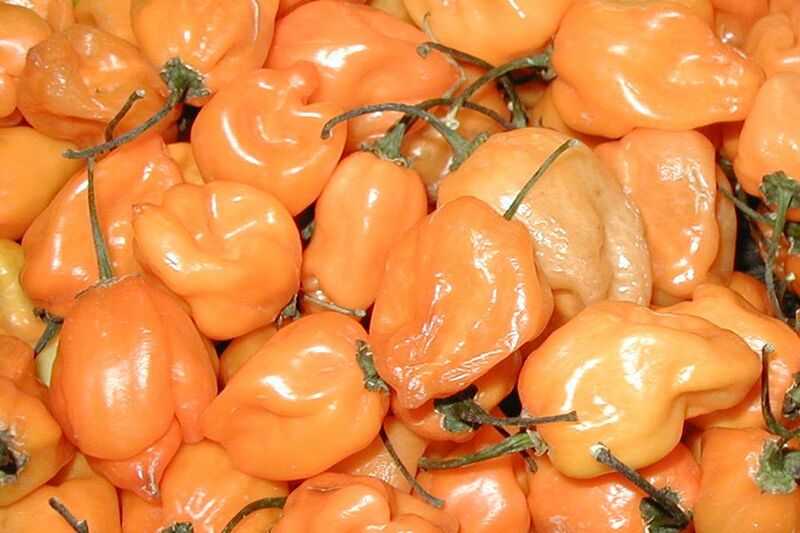 Habaneros are hot peppers. Pronounced: ah-bahn-air-oh. Common pronunciation error: pronouncing the N like it has a tilde on it. It doesn't. Tomatillos are small, green tomatoes. Pronounced: toh-mah-tee-yoh. Common pronunciation error: pronouncing two Ls as in the word ball. Mole is a traditional Mexican sauce. In the U.S it usually has some unsweetened chocolate in it, along with chiles and other ingredients. Pronounced: mole-ay. Common pronunciation error: saying the last syllable as if it rhymes with bee, or not pronouncing the last syllable at all. It's not a furry animal! If the words have Spanish influence, as many do in Arizona, a "J" or a "G" is usually pronounced like an "H". An "LL" is usually pronounced like a "Y". Pointing to the menu item is often easier than pronouncing it. The words 'jalapeño', 'habanero', 'Ay! Ay! Hot!' or a graphic of a red pepper means your meal is bound to be spicy. Have water or milk handy!